New Year and a time to look forward to the year ahead but firstly look back over the past 12 months and the many friendships and contacts made through the multitude of events and visits arranged by Menorca Britannia. The year started when on January 30th we fulfilled an invitation from the Bishop of Menorca to visit the Bishops Palace and the newly renovated Cathedral and enjoyed his personal conducted tour. 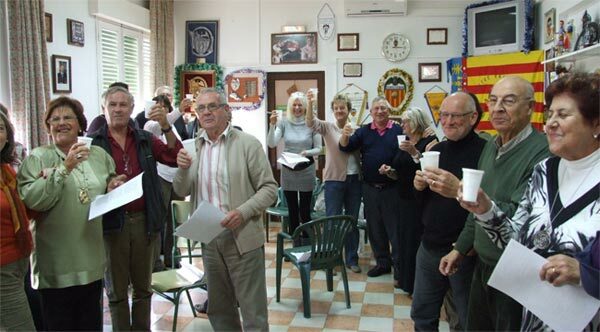 The evening of February 4th members saw a PowerPoint presentation and explanation of the Valencian “Fallas” by Richard and Ann with invited representatives from the Valencian Asociación. The beginning of a fruitful alliance. Obviously our most prestigious and memorable was in conceiving and arranging the commemoration event in late March “Collingwood 2010, Menorca”. This was a very ambitious event for our small association as it then was, but with its success the “door” was suddenly opened and a furtherance of the Aims and Objectives of Menorca Britannia became more attainable. Not only did the membership of the Asociación almost double but the several relationships with other associations and authorities are helping to make the events being arranged for 2011 truly very interesting. Previously over the weekend of the 6th/9th March Bryce and Sheila visited Newcastle upon Tyne at the invitation of Captain Stephen Healy, the Chairman of the Organising Committee and the Lord Mayor of Newcastle for the actual “Collingwood 2010”commemoration in the city of his birth and it was wonderful to welcome Stephen and his family together with Ms. Tamsin Lilley, Cultural and Heritage Officer of Morpeth when they visited our event. Their interest and participation in Menorca Britannia is to be very significant in 2011. In May members enjoyed a morning of bowls at the invitation of the Captain of the Menorca Bowls Club, Tony Preece and during 23rd/27th we entertained a group of some 20 members from the HMS Caliope Association (Newcastle), Conducted them on an Island Tour and a visit to Isla del Rey to see Menorca Britannia’s newly installed bust of Collingwood. We also attended their formal Mess Dinner in the Collingwood Hotel when along with other memento’s they presented a donation towards establishing a Collingwood Commemorative Garden to surround the bust. June saw a very enjoyable Dinner Dance, this year held at Rest. El Faro in Cala Torret and a visit by members to the Lithica and Jardins S’Hostal at Ciudadella. In July two special highlight of the summer were, firstly, the visit to the Golden Farm, San Antonio at the invitation of Doña Camila Delas-Vigo and Don Iñigo Orbaneja followed a week later by our evening aboard our specially chartered Yellow Catamaran for the Virgen de’l Carmen, (Blessing of the Fishing Boats). In August the Commanding Officer of the HMS Caliope, Commander Ed McNaught with his family visited and with escorted visits to Collingwood House and the Isla del Rey we were once again into escorting and entertaining mode. In September members had a wonderful morning visiting Mongofre near Addaya, and were able to look around the family home of Rubio Tuduri and an absolute living museum, part of the Fundacion Rubio and home to his daughter Snra Mercedes during her frequent visits to Menorca. Later in the month we also enjoyed an informative morning at the prehistoric village of Talati de Dalt. October 3rd and the first of what will definitely be an annual event. This was a joint venture between the Asociaciónes Menorca Britannia and the Valencianos In the Plaça Mercat, Es Castell we organised a grand paella and accompanying music. With the desserts being made and supplied by the British members this was a great meeting of cultures and many friendships made. Also in October the Policia Nacional gave us a very interesting presentation of their work and that of the other police forces in Spain. December and Coronel Fornals gave us an interesting and very informative presentation of Port Mahón and the various Admirals with close connections with Menorca during the British colonial time of the 18th century. Describing in detail the building of the original naval dockyard and through to that which still exists today. With the co-operation by Bryce who translated for the English speaking members the evening was well attended. During the course of the later part of the year and as part of the extensive Newcastle Collingwood Commemoration it was decided to link various schools in that area to schools in Menorca. We now have close liaison with the Director of Education in Menorca who is organising more schools here to join with those we have already established. The Collingwood Primary and Biddick Hall Schools already linking with Instituto Cap de Llevant. In the near future it is hoped that the Royal Grammar School in Newcastle, (Admiral Collingwood was an “Old Boy” of the RGS) and also some schools in Morpeth.will be linking with other schools in Menorca. At our last language exchange with the Valencianos when the theme was each other’s Christmas Traditions we ended by raising a Copa to a Feliz Navidad y Prospero Año Nuevo. To you all, Members and Friends of the Asociación Menorca Britannia and readers we wish the same message.